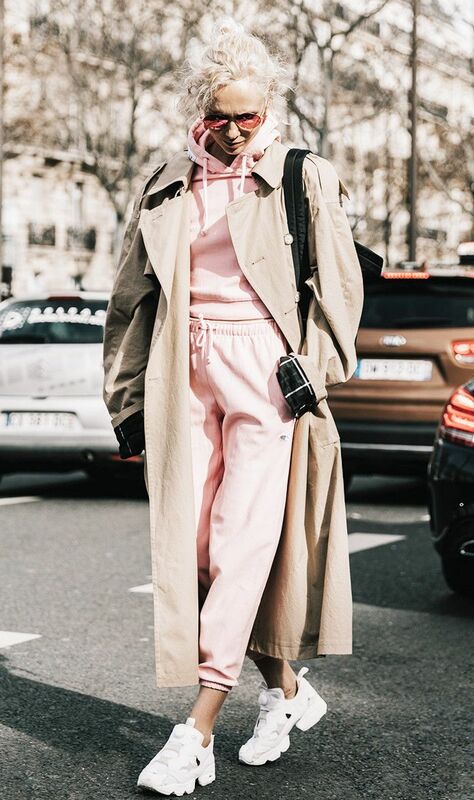 We have witnessed our fair share of sneaker trends this year, whether it be pastel sneakers, sock-boot sneakers, or slip-on sneakers, but the sneaker trend that is currently dominating the fashion scene is definitely one for the books. At first, it was hard to pinpoint what the style we were suddenly seeing everywhere reminded us of, but then it hit us—it reminded us of our dads. Or at least a dad somewhere who wears jeans that are two sizes too big, a half-zip sweatshirt, and sneakers that are semi-awkward, kind of puffy, and far from "cutting-edge." Regardless of your opinion on the matter, dad sneakers are a thing, and we have the street style shots and the products to prove it. Retailers across the board including Net-a-Porter, Zara, Barneys, and H&M are all stocked with different variations of this new 2017 sneaker trend, and we can't wait for you to shop some of them yourself. Go on to check out this new sneaker trend in action, and be sure to shop the dad sneakers we love afterward. Layer classic pieces like a trench coat over your athleisure sets for a well-rounded look. A pajama top and sneakers have never looked more at home than they do when paired with this pinstripe suit. When it's too cold to function, you don't always have to sacrifice your style. Instead, layer two of your favorite jackets together. Color-block sneakers add just the modern touch that an otherwise androgynous look is missing. The best way to make your all-black ensemble pop is by contrasting it with stark white sneakers. This outfit is walking proof that there is absolutely no such thing as too many layers. Do tights feel a bit too prissy for you? I bet wearing some with high-top sneakers will break that premonition of yours. Apparently, colored tights are the hero piece of street style star's wardrobes, and we aren't mad about it. These probably bring you right back to the third grade. We are pretty sure these sneakers came straight from the future. Talk about a sleek sneaker. Fashion girls can't get enough of this classic style. These also come in red, and they are just as good. Sneakers with just the right amount of shine. Your favorite summer dress is in need of these chunky sneaks. How perfect would distressed boyfriend jeans look with these? Topshop always wins us over with its festive colors. Another fashion-girl favorite in the books. Take these straight from the gym to brunch. In case all of these seem a little too masculine for you, here's one with a bow. Velcro is back, and it's better. Get you a pair of sneakers that can do both. What do you think about this new sneaker trend? Do you love it or hate it? Let us know in the comments below!